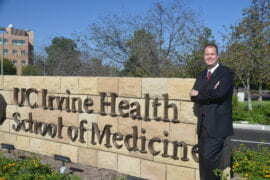 Dr. Morris Hasson of UCI's Executive Health Program offers his tips for a healthier 2011. A key is to set reasonable goals and see to them. Typically, each new year brings the same old resolutions to lose weight and get fit. Gym memberships soar, and millions of Americans initiate weight-loss plans. But clearly — with two-thirds of adults either overweight or obese, according to the Centers for Disease Control & Prevention — those goals are rarely achieved. We asked Dr. Morris Hasson how to tip the scales in dieters’ favor. Medical director for UC Irvine’s Executive Health Program and Weight Management Program, he also offers ideas for overall well-being. Q: What general advice do you have for those who aspire to be healthier in 2011? A: Don’t gain any weight! Every year, most of my patients tell me they want to take off 10 to 20 pounds. Most of them put on 3 to 5 pounds per year. Over 10 years, that’s 30 to 50 pounds! It’s hard to stop gaining weight, let alone lose any. Q: How can people eat more sensibly? A: A healthier diet reduces intake of fat, sugar and sodium, which are often found together in processed foods. But it’s more positive to think about what to add instead of what to avoid. The best rule is to try to consume five servings of fruits or vegetables per day — ideally with a variety of colors, like apples, oranges, broccoli, purple grapes and potatoes. This fills our stomachs with lower-fat, less calorie-dense foods and forces us to eat more often. When there’s a long time between meals or snacks, anyone would be hungrier. I’ve found that to get in five servings of fruits or vegetables per day often requires eating three servings by lunch, and some people need to consume four by the time they leave work to go home. This rule usually necessitates cutting down on portion sizes in general, which is why it works for weight reduction as well. A: Exercise is the best predictor of keeping weight off. In addition, a large body of evidence reveals that regular physical activity provides the same health benefits as treating high blood pressure or high cholesterol. This entails 30 minutes of moderate physical activity five days per week (walking 3 to 4 miles per hour, gardening, riding a bike leisurely, playing with children, etc.) or 20 minutes of vigorous activity three days a week. Q: Is getting an annual physical exam that important? A: It’s important to have an established relationship with a primary care provider. Most preventive services are ordered at the time of a periodic health maintenance visit, such as mammograms for women, colon cancer screenings and blood testing. When people don’t have any chronic medical conditions, this may be the only opportunity to get preventive care. Although there are no strict guidelines, these visits are typically recommended every one to three years if you’re under 50, then yearly after reaching 50. It’s also important to get your vaccinations up to date. Tetanus is due every 10 years. For the last five years or so, pertussis — or whooping cough — has been added to the adult tetanus shot. Pertussis causes one-third of the coughs that last over two weeks in adults. Other vaccinations, such as those for pneumonia and shingles, are important depending on your underlying health conditions, age or travel plans. Q: Anything else you can recommend? A: There are some simple things you can do to help reduce and handle stress: engage in physical activity, be more assertive, delegate responsibility when possible, learn and practice time management skills, develop and use a support system, meditate and participate in a hobby. Learn to recognize situations that typically produce stress and try to limit or avoid them. A wealth of research has shown that short of medications, physical activity is the most powerful tool we have for managing stress and depression. Incorporating physical activity into your lifestyle is one of the best ways to improve mental health. Q: What are some tips for achieving health aims? A: The most important factors are to make your goals reasonable and to facilitate reaching them as soon as possible. If you want to work on weight control, have healthy snacks easily accessible around the house. For increasing exercise, have a regularly scheduled time in your day and consider exercising with a friend or group. The pressure of not letting your friends down may make the difference sometimes. Also try writing a list of reasons why the habits you’re striving to develop are important — for example, living with more vigor, getting or staying off medications, living long enough to retire or see your grandchildren, etc. Healthier cafeteria food, more intense gym classes lower students’ diabetes risk.